Los Angeles’s Mayor, Antonio Villaraigosa, —it is rumored –will be making a visit to Venice on Tuesday. The homeless are seeking the Mayor’s help this week in stopping homeless hate. 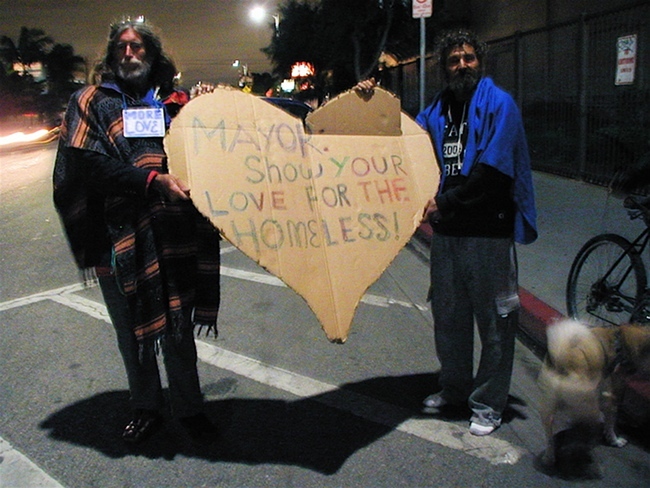 With signs and banners, “Venice Love,” a coalition of the vehicle-dwellers/homeless community, and their supporters, are launching what they see as an urgent appeal to Los Angeles Mayor Villaraigosa that he personally visit, and meet with them, and help end Venice’s now completely out-of-control vehicle seizures and anti-homeless actions. Recent police attacks which prevent people with vehicles from sleeping in them (illegal!) when all of L.A.’s shelters are full are forcing many of Venice’s RV-dwellers to sleep on the sidewalks (legal!) –outside their vehicles –often with their pets, to avoid violating L.A. ordinances. “Where is there any ‘Venice love’ in this?” asks the group, “Venice Love,” who’s members have been seeking for months to bring some humanity to L.A.’s recent treatment of R.V. dwellers in Venice Beach: in the face of the area’s months-now broken promises, local talk radio attacks and overblown accusations against the poor here –after a series of over-hyped RV waste dumping incidents that were siezed on by a small number in the community that have long-been seeking to transform Venice Beach from a diverse community into a “rich-only-welcome” enclave. “We need the Mayor’s help in this,” says the group. The urgent public appeal to the Mayor, the night before his expected visit, comes on top of the scrapping of Councilman Bill Rosendahl’s until-now two-year-long promise to amend a city ordinance against vehicle dwellers (a surprise Rosendahl announcement against the vehiculary-housed that has brought a Venice community uproar in recent weeks); sparking the arrest of one homeless protester at a Los Angeles City Hall meeting in January, when it was revealed by the councilman. The coalition says –recent LAPD actions, stepped-up against the homeless in Venice in recent weeks -have resulted in scores of homeless people heartlessly being arrested; their pets impounded. Over 40 homeless people’s RV’s, cars and vans have been seized in the last 4 months alone: some more than once. LAPD’s actions are further suspected to have contributed to the recent still-unexplained death of one long-time Venice resident, James Hunter, who had hidden himself inside his tightly closed van to avoid police detection: and who may yet be found to have died from overheating and stress-related causes stemming from fear of the police sweeps. In their latest attacks, in addition to new city signs banning RV’s on more Venice streets between the hours of 2 am and 6:00 am, LAPD has begun newly increased rounds of arrests and towing, despite a pending Federal lawsuit, and increased verbal threats to RV-owners. Marking tires: now often as soon as they spot an RV on any street in Venice. “Not only has Rosendahl lied about his promise to Venice to put a vehicle-parking area here for the currently vehicluarly housed –but he’s not taken a single step to provide for the dedicated RV-dwelling and homeless artist community. By mobilizing the entire community between now and this summer, and appealing to other government officials, we intend to stop all this. We are not going to allow Rosendahl, and his developer cronies, hiding behind hate and broken promises, with plans to give areas of Venice to high-density developers –to take the love of diversity and concern for all, and acceptance of all, out of the heart Venice — to replace it with a beach soon closed to all but the rich,” states community activist David Busch. Many of Venice’s RV-dwellers are not transient homeless people, but are among the artists and performers who have made and keep Venice Beach one of Los Angeles’ largest tourist attractions. “I have always considered Venice Beach to be my home until now” states one RV-dweller, and Venice Love press conference speaker, the renowned impressionist painter Diane Butler. Butler‘s work as a Boardwalk painter has been noted by a prominent New York Times art critic, as well as other art critics from around the world. Butler founded “Circle of Color”, and with her husband, artist/musician Ibrahim, continued the bi-annual “Solstice Art Happening,” at the legendary Venice Sponto Gallery, for 20 years. Butler grew up in the area –and has lived as an artist in Venice for the last 40 years. The artist has taken, in recent weeks, to sleeping on the Venice sidewalks with her dogs at night –which is permitted only from 9 pm to 6 am in the mornings –just in order to keep police from seizing her RV.